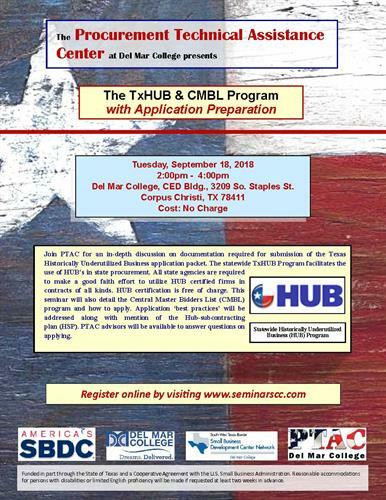 Join PTAC for an in-depth discussion about the documentation required for submission of the Texas Historically Underutilized Businesses application packet. The statewide TxHUB program facilitates the use of HUBs in state procurement. All state agencies are required to make a good faith effort to utilize HUB-certified firms in contracts of all kinds. HUB certification is free of charge. This seminar also will detail the Centralized Master Bidders List program. Application ‘best practices’ will be addressed along with mention of the Hub-subcontracting plan (HSP). PTAC advisors will be available to answer your questions on applying.